Washington has become so dysfunctional. Yes it has. And why is it that, Mr. Majority Leader? Could it have something to do with the party that uses the filibuster as a matter of routine, imposing a super-majority requirement on all legislation and blocking even uncontroversial presidential nominees from coming to a vote? Could it have something to do with party that decided to play chicken with the country’s credit limit, a virtually unprecedented move that caused real harm to the economy? Could it have something to do with the party that turned down ridiculously lopsided compromises -- lopsided in its favor -- because it holds an absolutist position on taxes that would decimate the welfare state? No, Democrats aren’t blameless, either for the culture of Washington or the failure to pass meaningful legislation. Even now, conservative Democrats are resisting some parts of the jobs bill, particularly in the Senate. But for Cantor, of all people, to bemoan the dysfunction of Washington gives chutzpah a bad name. The proof is in the substantive position to which Cantor, and his allies, still hold. In the press conference, Cantor indicated House Republican would seek to find common ground with the administration and pass legislation on which the two sides agree. 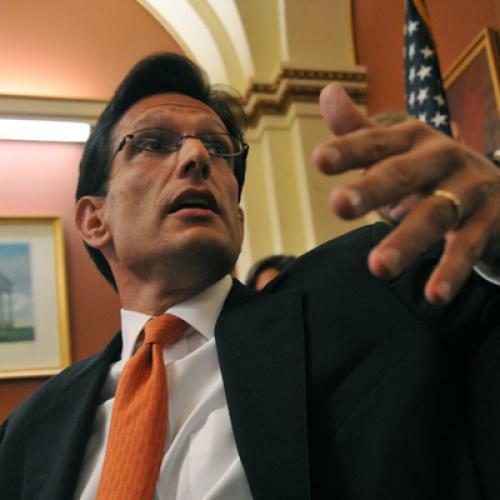 “Both sides have their desires to do the big bold things,” Cantor said. “The problem is they're just vastly different.... We should certainly focus on trying to put some wins on the board." Whether or not you like this agenda, it’s incredibly small scale -- and excludes even those items on Obama’s agenda with which Republicans have historically agreed, like the payroll tax cut. As Brad Plumer notes, House Republicans are backing away from their demands to slash highway funding -- most likely, in reaction to the political pressure the White House and assorted allies have applied. But it’s still not backing a serious infrastructure package, even though past generations of Republicans showed at least some support for such initiatives.